Fauré's Lydia from his 2 Songs, Op. 4 has been arranged for viola solo and piano by the world-famous violist Donald McInnes, who held a professorship at the University of Southern California from 1985 to 2014 and is known in virtually every corner of the artistic world for his appearances with major orchestras, recitals, chamber music participation, and numerous master classes. The 2 Songs, Op. 4 marked a period in which Faure moved away from his youthful penchant for the poems of Hugo. Instead, he began to tackle shorter lyrics by somewhat younger poets who had the power to inspire him to a more intense musical response. Leconte de Lisle's Lydia was an ideal match for the composer's new melodic espousal. Though the music appears with an element of simplicity at a first glance, a new sophistication emerged beneath the surface with a ravishing melodic line discreetly shadowed by the piano. An ancient Greek atmosphere is created partly by use of the Lydian mode with sharpened fourth of the scale. 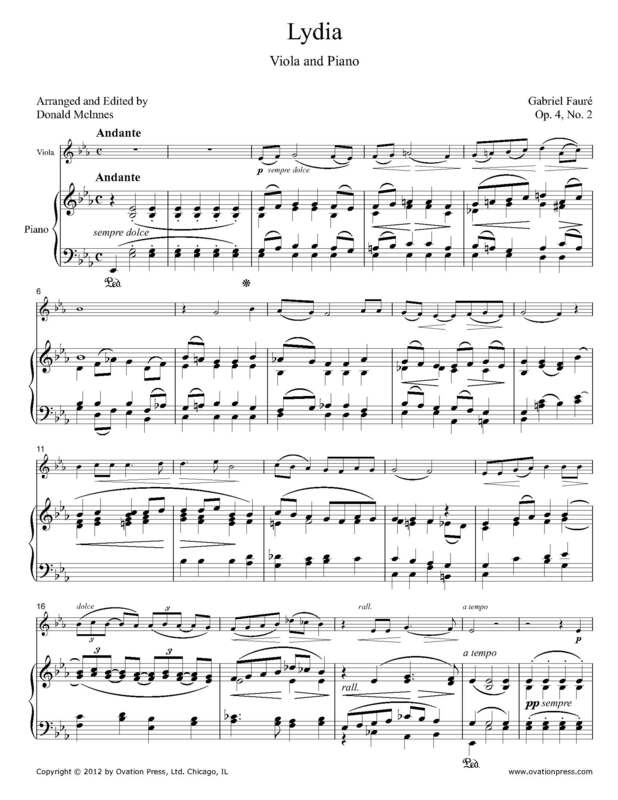 Download and print the score today to gain access to this expertly edited arrangement of Fauré's Lydia for viola and piano by Donald McInnes! Chanter sur ta lèvre en fleur. Une odeur divine en ton sein. Sorten de toi, jeunne déesse. Mon âme en baisers m’est ravie! Que je puisse mourir, mourir toujours! The fluid golden tresses which you loosen. Sing on your blossoming lips. A divine fragrance on your breast. Emanate from you, young goddess. Kisses have carried away my soul! That I may die, forever die!